I'm happy to announce the version 1.2 of my Expression Templates Library (ETL): ETL 1.2, two months after I released the version 1.1. This version features much better GPU Support, a few new features and a lot of changes in the internal code. Can be computed entirely on GPU. Each matrix and vector containers have a secondary GPU memory space. During the execution, the status of both memory spaces is being managed and when necessary, copies are made between two spaces. In the best case, there should only be initial copies to the GPU and then everything should be done on the GPU. I've also considered using Unified Memory in place of this system, but this is a problem for fast matrix and I'd rather not have two different systems. This is not perfect in terms of performance but this will be done without any copies between CPU and GPU memory. I plan to improve this system with a bit more complex operations to avoid too many GPU operations, but there will always be more operations than in CPU where this can easily be done in one go. There are a few expressions that are not computable on the GPU, such as random generations. A few transformations are also not fully compatible with GPU. Moreover, if you access an element with operators  or (), this will invalidate the GPU memory and force an update to the CPU memory. GPU operations are not implemented directly in ETL, there are coming from various libraries. ETL is using NVIDIA CUDNN, CUFFT and CUDNN for most algorithms. Moreover, for other operations, I've implemented a libraries with simple GPU operations: ETL-GPU-BLAS (EGBLAS). You can have a look at egblas if you are interested. As you can see, the performances on GPU are now excellent. DLL's performances are on par with Tensorflow and Keras! Again, using the new version of ETL inside DLL has led to excellent performance. The framework is again on par with TensorFlow and Keras and faster than all the other frameworks. 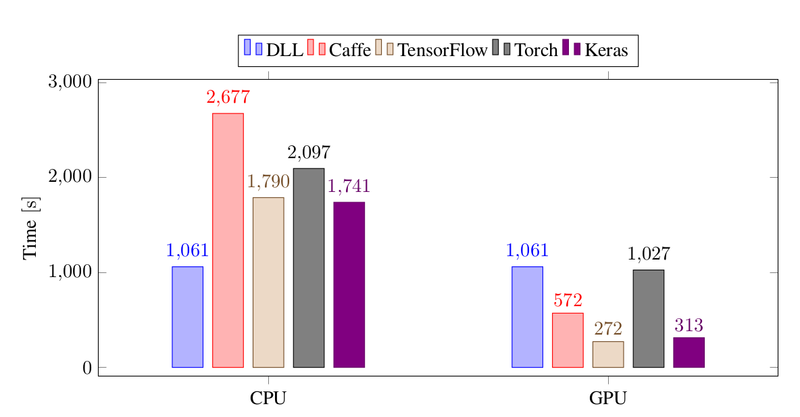 The large difference between DLL and Tensorflow and Keras is due to the inefficiency of reading the dataset in the two frameworks, so the performance of the three framework themselves are about the same. The library also has a few other new features. Logarithms of base 2 and base 10 are now supported in complement to the base e that was already available before. Categorical Cross Entropy (CCE) computation is also available now, the CCE loss and error can be computed for one or many samples. Convolutions have also been improved in that you can use mixed types in both the image and the kernel and different storage order as well. Nevertheless, the most optimized version remains the version with the same storage order and the same data type. I've also made a major change in the way implementations are selected for each operation. The tests and the benchmark are using a system to force the selection of an algorithm. This system is now disabled by default. This makes the compilation much faster by default. Since it's not necessary in most cases, this will help regular use cases of the library by compiling much faster. Overall, the support for complex numbers has been improved in ETL. There are more routines that are supported and etl::complex is better supported throughout the code. I'll still work on this in the future to make it totally complete. The internal code also has a few new changes. First, all traits have been rewritten to use variable templates instead of struct traits. This makes the code much nicer in my opinion. Moreover, I've started experimenting with C++17 if constexpr. Most of the if conditions that can be transformed to if constexpr have been annotated with comments that I can quickly enable or disable so that I can test the impact of C++17, especially on compilation time. Finally, a few bugs have been fixed. ETL is now working better with parallel BLAS library. There should not be issues with double parallelization in ETL and BLAS. There was a slight bug in the Column-Major matrix-matrix multiplication kernel. Binary operations with different types in the left and right hand sides was also problematic with vectorization. The last bug was about GPU status in case ETL containers were moved. I don't yet know exactly on which features I'm going to focus for the next version of ETL. I plan to focus a bit more in the near future on Deep Learning Library (DLL) for which I should release the version 1.0 soon. I also plan to start support for Recurrent Neural Networks on it, so that will take me quite some time. Nevertheless, I'm still planning to consider the switch to C++17, since it is a bit faster to compile ETL with if constexpr. The next version of ETL will also probably have GPU-support for integers, at least in the cases that depend on the etl-gpu-blas library, which is the standard operators. I also plan to improve the support for complex numbers, especially in terms of performance and tests. Hopefully, I will have also time (and motivation) to start working on the sparse capabilities of ETL. It really needs much more unit tests and the performance should be improved as well. For the future release, there always will tags pointing to the corresponding commits. You can also have access to previous releases on Github or via the release tags. The documentation is still a bit sparse. There are a few examples and the Wiki, but there still is work to be done. If you have questions on how to use or configure the library, please don't hesitate. Don't hesitate to comment this post if you have any comment on this library or any question. You can also open an Issue on Github if you have a problem using this library or propose a Pull Request if you have any contribution you'd like to make to the library. C++11 Performance tip: Update on when to use std::pow ? A few days ago, I published a post comparing the performance of std::pow against direct multiplications. When not compiling with -ffast-math, direct multiplication was significantly faster than std::pow, around two orders of magnitude faster when comparing x * x * x and code:std::pow(x, 3). One comment that I've got was to test for which n is code:std::pow(x, n) becoming faster than multiplying in a loop. Since std::pow is using a special algorithm to perform the computation rather than be simply loop-based multiplications, there may be a point after which it's more interesting to use the algorithm rather than a loop. So I decided to do the tests. You can also find the result in the original article, which I've updated. We can see that the pow function time still remains stable while our loop-based pow function still increases linearly. At n=1000, std::pow is one order of magnitude faster than my_pow. Overall, if you do not care much about extreme accuracy, you may consider using you own pow function for small-ish (integer) n values. After n=100, it becomes more interesting to use std::pow. If you want more results on the subject, you take a look at the original article. My Deep Learning Library (DLL) project is a C++ library for training and using artificial neural networks (you can take a look at this post about DLL if you want more information). While I made a lot of effort to make it as fast as possible to train and run neural networks, the compilation time has been steadily going up and is becoming quite annoying. This library is heavily templated and all the matrix operations are done using my Expression Templates Library (ETL) which is more than template-heavy itself. In this post, I'll present two techniques with which I've been able to reduce the total compilation of the DLL unit tests by up to 38%. C++11 Performance tip: When to use std::pow ? Update: I've added a new section for larger values of n.
Recently, I've been wondering about the performance of std::pow(x, n). I'm talking here about the case when n is an integer. In the case when n is not an integer, I believe, you should always use std::pow or use another specialized library. In case when n is an integer, you can actually replace it with the direct equivalent (for instance std::pow(x, 3) = x * x x). If n is very large, you'd rather write a loop of course ;) In practice, we generally use powers of two and three much more often than power of 29, although that could happen. Of course, it especially make sense to wonder about this if the pow is used inside a loop. If you only use it once outside a loop, that won't be any difference on the overall performance. Since I'm mostly interested in single precision performance (neural networks are only about single precision), the first benchmarks will be using float. Almost three years ago, I published the version 0.4.1 of budgetwarrior. Since then, I've been using this tool almost every day to manage my personal budget. This is the only tool I use to keep track of my expenses and earnings and it makes a great tool for me. I recently felt that it was missing a few features and added them and polished a few things as well and release a new version with all the new stuff. This new version is probably nothing fancy, but a nice upgrade of the tool. Don't pay too much attention to the values in the images since I've randomized all the data for the purpose of this post (new feature, by the way :P). This view gives concise information about the current state of your accounts. It also gives information about your yearly and monthly objectives. Finally, it also gives information about the last two fortune values that you've set. I think this make a great kind of dashboard to view most of the information. If your terminal is large enough, the three parts will be shown side by side. 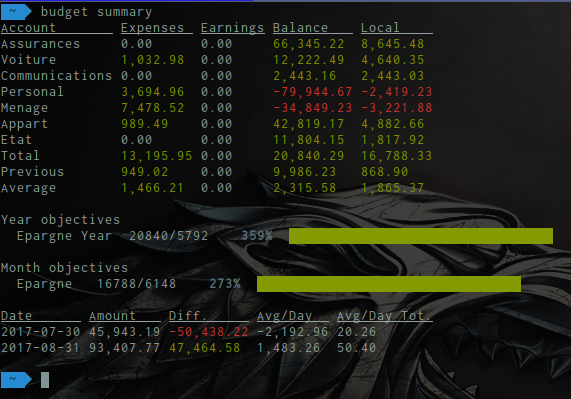 It now display the time between the different fortune values and it compute the average savings (or avg losses) per day in each interval and in average from the beginning of the first value. The balance does not propagate over the years anymore. This should mainly change the behaviour of budget overview. I don't think it was very smart to propagate it all the time. The balance now starts at zero for each year. If you want the old system, you can use the multi_year_balance=true option in the .budgetrc configuration file. Fixed a few bugs with inconsistency between the different views and reports. Another bug that was fixed is that budget report was not always displaying the first month of the year correctly, this is now fixed. 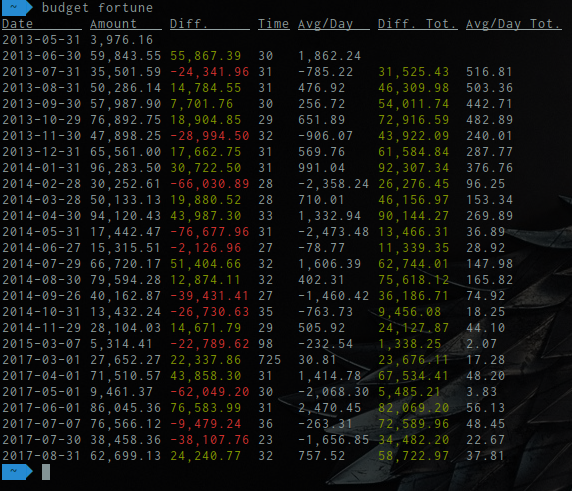 The graphs display in budget report are now automatically adapted to width of your terminal. Finally, the budget overview command also displays more information about the comparison with the previous month. If you are on Arch Linux, you can use this AUR repository. A brief tutorial is available on Github: Starting guide. If you have any other comment, don't hesitate to contact me, either by letting a comment on this post or by email. In this post, we are going to talk about futures, more precisely std::future<T>. What is a future ? It's a very nice and simple mechanism to work with asynchronous tasks. It also has the advantage of decoupling you from the threads themselves, you can do multithreading without using std::thread. The future itself is a structure pointing to a result that will be computed in the future. How to create a future ? The simplest way is to use std::async that will create an asynchronous task and return a std::future. Nothing really special here. std::async will execute the task that we give it (here a lambda) and return a std::future. Once you use the get() function on a future, it will wait until the result is available and return this result to you once it is. The get() function is then blocking. Since the lambda, is a void lambda, the returned future is of type std::future<void> and get() returns void as well. It is very important to know that you cannot call get several times on the same future. Once the result is consumed, you cannot consume it again! If you want to use the result several times, you need to store it yourself after you called get(). // Do something else ? This time, the future will be of the time std::future<int> and thus get() will also return an int. std::async will again launch a task in an asynchronous way and future.get() will wait for the answer. What is interesting, is that you can do something else before the call to future. But get() is not the only interesting function in std::future. You also have wait() which is almost the same as get() but does not consume the result. For instance, you can wait for several futures and then consume their result together. But, more interesting are the wait_for(duration) and wait_until(timepoint) functions. The first one wait for the result at most the given time and then returns and the second one wait for the result at most until the given time point. I think that wait_for is more useful in practices, so let's discuss it further. Finally, an interesting function is bool valid(). When you use get() on the future, it will consume the result, making valid() returns :code:`false. So, if you intend to check multiple times for a future, you should use valid() first. The three tasks are started asynchronously with std::async and the resulting std::future are stored. Then, as long as one of the tasks is not complete, we query each three task and try to process its result. If no result is available, we simply do something else. This example is important to understand, it covers pretty much every concept of the futures. Pretty practical :) All The created std::future<size_t> are stored in a std::vector and then are all queried for their result. Overall, I think std::future and std::async are great tool that can simplify your asynchronous code a lot. They allow you to make pretty advanced stuff while keeping the complexity of the code to a minimum. I do not yet know if there will be a next installment in the series. I've covered pretty much everything that is available in C++11 for concurrency. I may cover the parallel algorithms of C++17 in a following post. If you have any suggestion for the next post, don't hesitate to post a comment or contact me directly by email. This makes for some very nice syntax, but we still have a type rather than a value. Note that in some cases, you cannot use the using technique since it cannot be specialized and you often need specialization to write some more advanced traits. Really nothing fancy here, but that will be enough as examples. Even though all this works pretty, it can be made better on two points. First, every time you use a traits, you need to use the value member (via ::value). Secondly, every time you declare a new traits, you have to declare a new type or a type alias. But all you want is a boolean value. No more ::value everywhere :) I think it's really cool. Note that, unlike type alias template, they can be specialized, either fully or partially, so no more limitation on that side. Personally, I replaced all the type traits inside ETL using variable templates. If you don't want to do it, you can also introduce helpers like in the C++17 STL and start using the wrappers when you see fit so that you don't break any code. If you want to use this feature, you need a C++14 compiler, such as any version from GCC5 family or clang 3.6. Although I haven't tested, it should also work on Microsoft VS2015 Update 2. It comes from a bug in the handling of variable templates as dependent names. If you don't come in this cases, you can use GCC5 family directly, otherwise, you'll have to use GCC6 family only. I hope this can help some of you to improve your type traits or at least to discover the power of the new variable templates. Personally, I've rewritten all the traits from the ETL library using this new feature and I'm pretty satisfied with the result. Of course, that means that the compiler support was reduced, but since I don't have many users, it's not a real issue. How to fix mdadm RAID5 / RAID6 growing stuck at 0K/s ? The solution is the same if you are growing any type of RAID level with parity (RAID5, RAID6, ...). Normally, the issues I have are related to speed not very good. I've written a post in the post about how to speed up RAID5 / RAID6 growing with mdadm. Although RAID5 / RAID6 growing, or another reshape operation, will never be very fast, you can still speed up the process a lot from a few days to a few hours. Currently, my reshape is working at 48M/s and I'm looking at around 16 hours of reshape, but I have 13 disks of 3To, so it's not so bad. A few weeks ago, I talked about all the new features of my Deep Learning Library (DLL) project. I've mentioned that, on several experiments, DLL was always significantly faster than some popular deep learning frameworks such as TensorFlow. I'll now go into more details into this comparison and provide all the results. So far, the paper we wrote about these results has not been published, so I'll not provide the paper directly yet. For those that may not know, DLL is the project I've been developing to support my Ph.D. thesis. This is a neural network framework that supports Fully-Connected Neural Network (FCNN), Convolutional Neural Network (CNN), Restricted Boltzmann Machine (RBM), Deep Belief Network (DBN), Convolutional RBM (CRBM) and Convolutional DBN (CDBN). It also supports a large variety of options such as Dropout, Batch Normalization and Adaptive Learning Rates. You can read read the previous post if you want more information about the new features of the framework. And, as those of you that read my blog frequently may know, I'm a bit obsessed with performance optimization, so I've spent a considerable amount of time optimizing the performance of neural network training, on CPU. Since, at the beginning of my thesis, I had no access to GPU for training, I've focused on CPU. Although there is now support for GPU, the gains are not yet important enough. I've run four different experiments with all these frameworks and compared the efficiency of each of them for training the same neural networks with the same options. In each case, the training or testing error have also been compared to ensure that each framework is doing roughly the same. I wont present here the details, but in each experiment DLL showed around the same accuracies as the other frameworks. I will only focus on the speed results in this article. Each experiment is done once with only CPU and once with a GPU. For DLL, I only report the CPU time in both modes, since it's more stable and more optimized. The code for the evaluation is available online on the Github repository of the frameworks project. Training time performance for the different frameworks on the Fully-Connected Neural Network experiment, on MNIST. All the times are in seconds. In DLL mode, the DLL framework is the clear winner here! It's about 35% faster than TensorFlow and Keras which are coming at the second place. DLL is more than four times slower than DLL and the last two frameworks (Caffe and DeepLearning4J) are five times slower than DLL! Once we add a GPU to the system, the results are very different. Caffe is now the fastest framework, three times faster than DLL. DLL is less than two times slower than Keras and TensorFlow. Interestingly, DLL is still faster than Torch and DeepLearning4J. Training time performance for the different frameworks on the Convolutional Neural Network experiment, on MNIST. All the times are in seconds. Again, on CPU, DLL is the clear winner, by a lot! 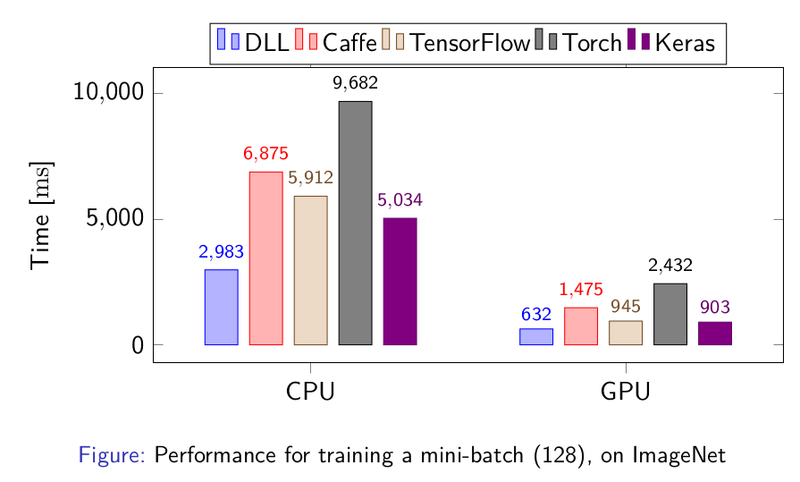 It's already 3.6 times faster than the second frameworks Keras and TensorFlow, more than four times faster than Caffe and Torch and 8 times faster than DeepLearning4J that is proving very slow on this experiment. 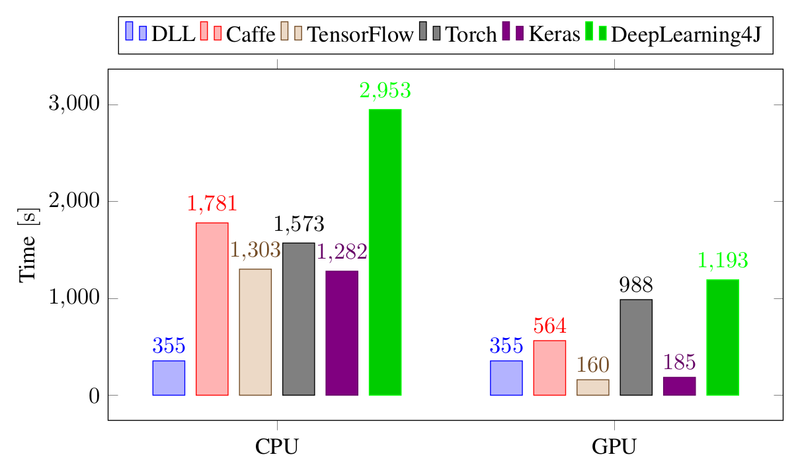 Once a GPU is added, Keras and TensorFlow are about twice faster than DLL. However, DLL is still faster than the other frameworks even though they are taking advantage of the GPU. Training time performance for the different frameworks on the Convolutional Neural Network experiment, on CIFAR-10. All the times are in seconds. DLL is still the fastest on CPU, but the margin is less than before. It's about 40% faster than TensorFlow and Keras, twice faster than Torch and 2.6 times faster than Caffe. Once a GPU is added, DLL is about as fast as Torch but slower than the other three frameworks. 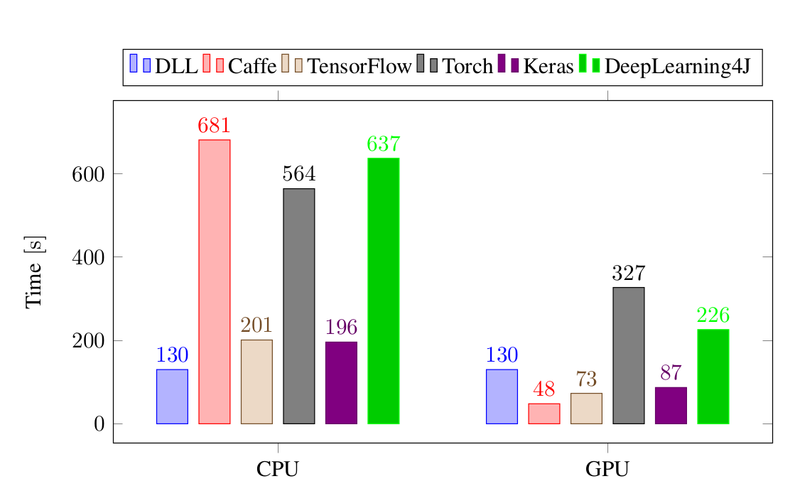 TensorFlow and Keras are about four times faster than DLL while Caffe is about twice faster than DLL. We can see that with this larger network, the GPU becomes more interesting and that there is a smaller margin for improvements compared to the other frameworks. Training time performance for the different frameworks on the Convolutional Neural Network experiment, on ImageNet. The times are the time necessary to train a batch of 128 images. All the times are in milliseconds. For this final experiment, DLL is again significantly faster than all the other frameworks. It's about 40% faster than Keras, twice faster than TensorFlow and Caffe and more than three times faster than Torch. Although 40% may seem not that much, don't forget that this kind of training may take days, so it can save you a lot of time. All the frameworks are much faster than DeepLearning4J. Based on several posts on the internet, I suspect that this comes from the model of GPU I have been used (GTX 960), but all the other frameworks seem to handle this card pretty well. I hope this is not too much of a bragging post :P We can see that my efforts to make the code as fast as possible have paid :) As was shown in the experiments, my DLL framework is always the fastest framework when the neural network is trained on CPU. I'm quite pleased with the results since I've done a lot of work to optimize the speed as much as possible and since I'm competing with well-known libraries that have been developed by several persons. Moreover, the accuracies of the trained networks is similar to that of the networks trained with the other frameworks. Even when the other frameworks are using GPU, the library still remains competitive, although never the fastest. In the next step (I've no idea when I'll have the time though), I will want to focus on GPU speed. This will mostly come from a better support of the GPU in the ETL library on which DLL is based. I have many ideas to improve it a lot, but it will take me a lot of time. It's been a while since I've done a benchmark of different compilers on C++ code. Since I've recently released the version 1.1 of my ETL project (an optimized matrix/vector computation library with expression templates), I've decided to use it as the base of my benchmark. It's a C++14 library with a lot of templates. I'm going to compile the full test suite (124 test cases). This is done directly on the last release (1.1) code. I'm going to compile once in debug mode and once in release_debug (release plus debug symbols and assertions) and record the times for each compiler. The tests were compiled with support for every option in ETL to account to maximal compilation time. Each compilation was made using four threads (make -j4). I'm also going to test a few of the benchmarks to see the difference in runtime performance between the code generated by each compiler. The benchmark will be compiled in release mode and its compilation time recorded as well. All have been installed directly using Portage (Gentoo package manager) except for clang-4.0.1 that has been installed from sources and zapcc since it does not have a Gentoo package. Since clang package on Gentoo does not support multislotting, I had to install one version from source and the other from the package manager. This is also the reason I'm testing less versions of clang, simply less practical. In each case, a lot of warnings are enabled and the ETL options are the same. All the results have been gathered on a Gentoo machine running on Intel Core i7-2600 (Sandy Bridge...) @3.4GHz with 4 cores and 8 threads, 12Go of RAM and a SSD. I do my best to isolate as much as possible the benchmark from perturbations and that my benchmark code is quite sound, it may well be that some results are not totally accurate. Moreover, some of the benchmarks are using multithreading, which may add some noise and unpredictability. When I was not sure about the results, I ran the benchmarks several time to confirm them and overall I'm confident of the results. Note: For Release_Debug and Benchmark, I only use three threads with zapcc, because 12Go of RAM is not enough memory for four threads. There are some very significant differences between the different compilers. Overall, clang-4.0.1 is by far the fastest free compiler for Debug mode. When the tests are compiled with optimizations however, clang is falling behind. It's quite impressive how clang-4.0.1 manages to be so much faster than clang-3.9.1 both in debug mode and release mode. Really great work by the clang team here! With these optimizations, clang-4.0.1 is almost on par with gcc-7.1 in release mode. For GCC, it seems that the cost of optimization has been going up quite significantly. However, GCC 7.1 seems to have made optimization faster and standard compilation much faster as well. If we take into account zapcc, it's the fastest compiler on debug mode, but it's slower than several gcc versions on release mode. Overall, I'm quite impressed by the performance of clang-4.0.1 which seems really fast! I'll definitely make more tests with this new version of the compiler in the near future. It's also good to see that g++-7.1 also did make the build faster than gcc-6.3. However, the fastest gcc version for optimization is still gcc-4.9.4 which is already an old branch with low C++ standard support. Let's now take a look at the quality of the generated code. For some of the benchmarks, I've included two versions of the algorithm. std is the most simple algorithm (the naive one) and vec is the hand-crafted vectorized and optimized implementation. All the tests were done on single-precision floating points. The differences are not very significant between the different compilers. The clang-based compilers seem to be the compilers producing the fastest code. Interestingly, there seem to have been a big regression in gcc-6.3 for large containers, but that has been fixed in gcc-7.1. If we look at the optimized version, the differences are even slower. Again, the clang-based compilers are producing the fastest executables, but are closely followed by gcc, except for gcc-6.3 in which we can still see the same regression as before. Interestingly, we can see that gcc-7.1 is the fastest for small vectors while clang-4.0 is the best for producing code for larger vectors. However, except for the biggest vector size, the difference is not really significantly. Apparently, there is a regression in zapcc (or clang-5.0) since it's slower than clang-4.0 at the same level as clang-3.9. Even on the biggest vector, this is a very fast operation, once vectorized and parallelized. At this speed, some of the differences observed may not be highly significant. Again clang-based versions are the fastest versions on this code, but by a small margin. There also seems to be a slight regression in gcc-7.1, but again quite small. The next benchmark is testing the performance of a Matrix-Matrix Multiplication, an operation known as GEMM in the BLAS nomenclature. In that case, we test both the naive and the optimized vectorized implementation. To save some horizontal space, I've split the tables in two. This time, the differences between the different compilers are very significant. The clang compilers are leading the way by a large margin here, with clang-4.0 being the fastest of them (by another nice margin). Indeed, clang-4.0.1 is producing code that is, on average, about twice faster than the code generated by the best GCC compiler. Very interestingly as well, we can see a huge regression starting from GCC-5.4 and that is still here in GCC-7.1. Indeed, the best GCC version, in the tested versions, is again GCC-4.9.4. Clang is really doing an excellent job of compiling the GEMM code. As for the optimized version, it seems that the two families are reversed. Indeed, GCC is doing a better job than clang here, and although the margin is not as big as before, it's still significant. We can still observe a small regression in GCC versions because the 4.9 version is again the fastest. As for clang versions, it seems that clang-5.0 (used in zapcc) has had some performance improvements for this case. For this case of matrix-matrix multiplication, it's very impressive that the differences in the non-optimized code are so significant. And it's also impressive that each family of compilers has its own strength, clang being seemingly much better at handling unoptimized code while GCC is better at handling vectorized code. The last benchmark that I considered is the case of the valid convolution on 2D images. The code is quite similar to the GEMM code but more complicated to optimized due to cache locality. In that case, we can observe the same as for the GEMM. The clang-based versions are much producing significantly faster code than the GCC versions. Moreover, we can also observe the same large regression starting from GCC-5.4. This time, clang manages to produce excellent results. Indeed, all the produced executables are significantly faster than the versions produced by GCC, except for GCC-7.1 which is producing similar results. The other versions of GCC are falling behind it seems. It seems that it was only for the GEMM that clang was having a lot of troubles handling the optimized code. Clang seems to have recently done a lot of optimizations regarding compilation time. Indeed, clang-4.0.1 is much faster for compilation than clang-3.9. Although GCC-7.1 is faster than GCC-6.3, all the GCC versions are slower than GCC-4.9.4 which is the fastest at compiling code with optimizations. GCC-7.1 is the fastest GCC version for compiling code in debug mode. In some cases, there is almost no difference between different compilers in the generated code. However, in more complex algorithms such as the matrix-matrix multiplication or the two-dimensional convolution, the differences can be quite significant. In my tests, Clang have shown to be much better at compiling unoptimized code. However, and especially in the GEMM case, it seems to be worse than GCC at handling hand-optimized. I will investigate that case and try to tailor the code so that clang is having a better time with it. For me, it's really weird that the GCC regression, apparently starting from GCC-5.4, has still not been fixed in GCC 7.1. I was thinking of dropping support for GCC-4.9 in order to go full C++14 support, but now I may have to reconsider my position. However, seeing that GCC is generally the best at handling optimized code (especially for GEMM), I may be able to do the transition, since the optimized code will be used in most cases. As for zapcc, although it is still the fastest compiler in debug mode, with the new speed of clang-4.0.1, its margin is quite small. Moreover, on optimized build, it's not as fast as GCC. If you use clang and can have access to zapcc, it's still quite a good option to save some time. Overall, I have been quite pleased by clang-4.0.1 and GCC-7.1, the most recent versions I have been testing. It seems that they did quite some good work. I will definitely run some more tests with them and try to adapt the code. I'm still considering whether I will drop support for some older compilers. 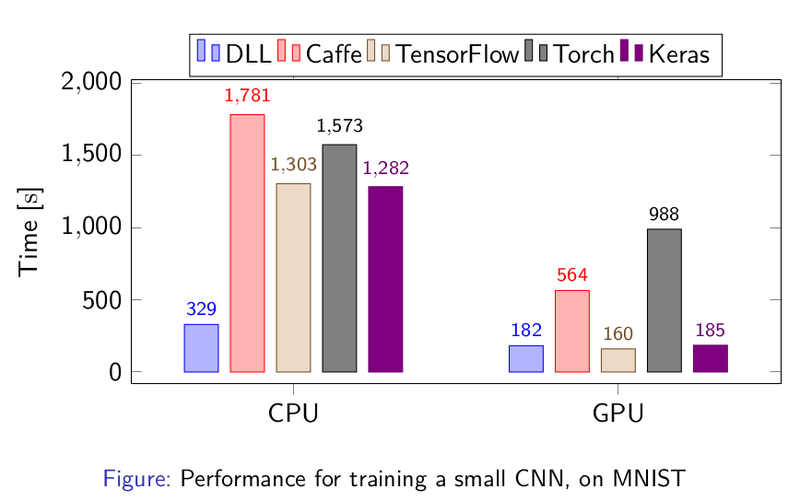 I hope this comparison was interesting :) My next post will probably be about the difference in performance between my machine learning framework and other frameworks to train neural networks.